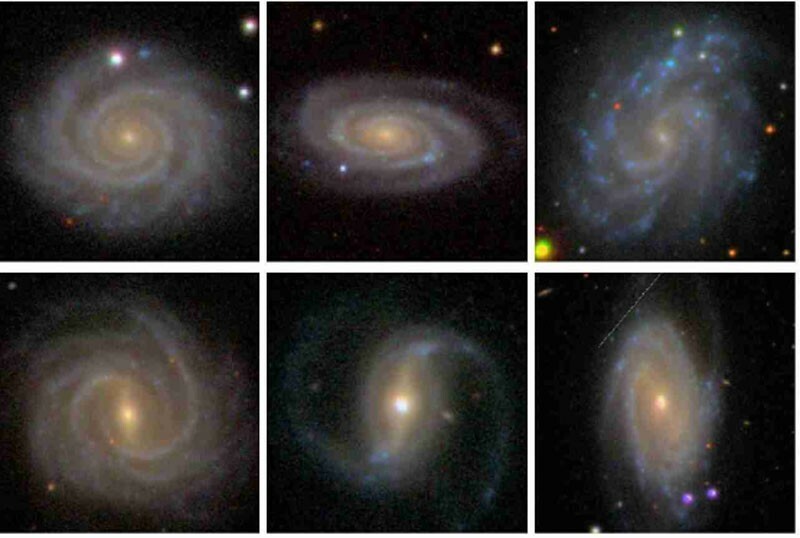 If spiral galaxies have a preferred direction, it just might be. But not everything in the physical Universe obeys the same symmetric laws. For example, take one of the fundamental particles in our Universe: the muon. Muons are charged particles similar to electrons, except about 207 times heavier. After 2.2 microseconds, on average, a muon will decay into an electron, a neutrino and an antineutrino. 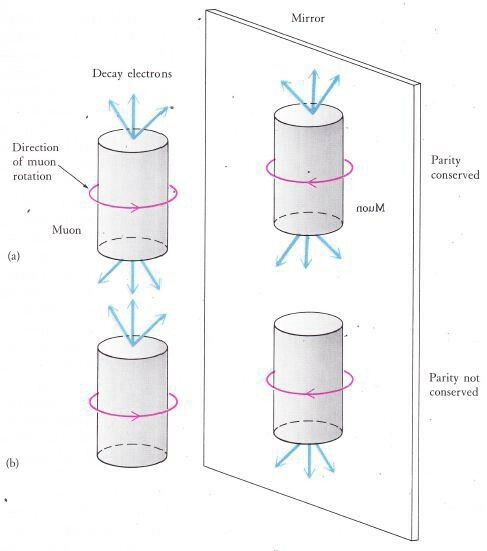 The funny thing about this is that muons spin, and depending on what direction the muon spins in, that determines what direction the electron comes out. Take your right hand, curl your fingers and point your thumb. If the muon spins counterclockwise (in the direction of your fingers), then the electron will be ejected along the axis of your thumb. 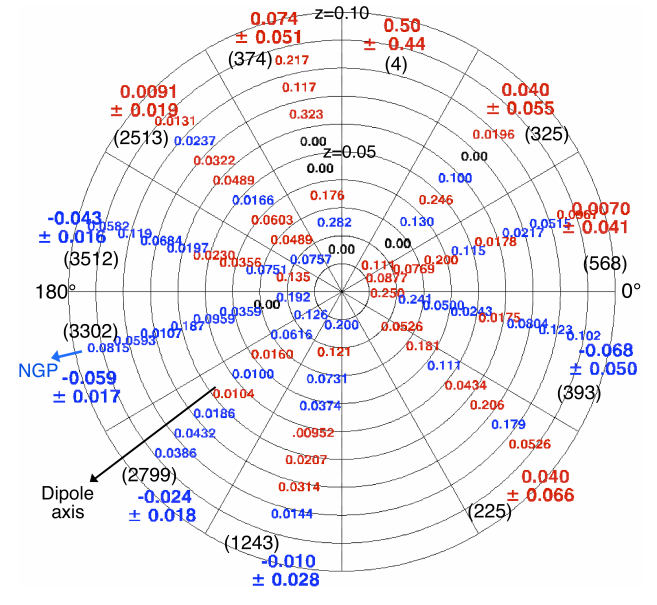 Image credit: author durbarsquare of http://readingpenrose.com/2014/05/07/on-cpt-symmetry-and-time-reversal-i/. You might expect that the laws of physics would be mirror-image symmetric, and that if we had a muon spinning counterclockwise that decays “upwards,” we could just as easily have the mirror reflection of that: a muon spinning clockwise that also decays “upwards.” This would be analogous to curling your right hand’s fingers and pointing your thumb upwards, looking in the mirror and seeing your reflection’s left hand. But that doesn’t happen! 99.9% of the muons that exist decay in this right-handed fashion, and instead of working like example (a) above, the real world almost always works like example (b). So there are some fundamental forces and interactions that have a preference for “handedness,” or a preferred direction. Could galaxies be one of them? Image credit: Tony Hallas of Astrophoto.com, via http://apod.nasa.gov/apod/ap070719.html. Theoretically, they shouldn’t be. To the best of our understanding, the Universe was born — dating from the Big Bang — relatively uniform, with only slight underdensities and overdensities in various regions. 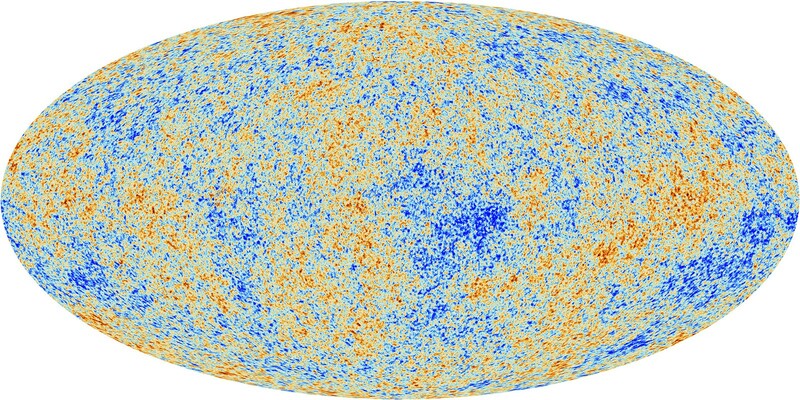 We see evidence consistent with this in the way structure has formed in the Universe, with the best evidence coming from the cosmic microwave background, our snapshot of things dating from when the Universe was just 380,000 years old! But what you don’t see in this map is that while this was going on, these fluctuations weren’t just sitting there, they were made up of particles and radiation, swarming around at incredible velocities. They constantly crashed into one another, and — among other things — experienced turbulence, sloshing around and exchanging angular momentum, or an intrinsic amount of rotation. The patterns that you would have seen in the very young Universe wouldn’t have been so different from what you see in a wind tunnel where the airflow gets disrupted. Image credit: ©2014 New Zealand eScience Infrastructure, via https://www.nesi.org.nz/case-studies/advancing-computational-fluid-dynamics. Think about how rotational motion works in something like a figure skater. When they pull their arms-and-legs in, they spin faster; when they extend them, they spin more slowly. Image credit: video broadcast of Nancy Kerrigan during the 1994 Olympics; via Popsugar. Well, this is because rotation is based on both the amount of mass in a system as well as how that mass is distributed. As time goes on and the Universe expands, that mass gets much more extended and rotates extremely slowly. But over time, gravity will cause collapse into clusters and galaxies, and that angular momentum not only remains, but multiple masses interact with one another, producing equal-and-opposite torques. By time we’re ready to form galaxies — to the best of our understanding — the ones that form spirals should form clockwise and counterclockwise spirals in roughly equal numbers. At least, that’s what we’d expect. 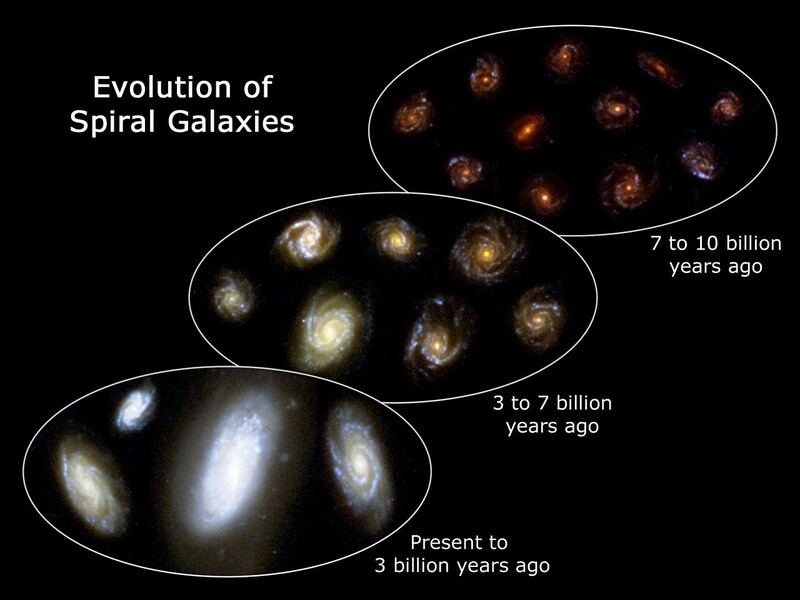 What we wouldn’t expect is that all the galaxies rotate in the same direction. 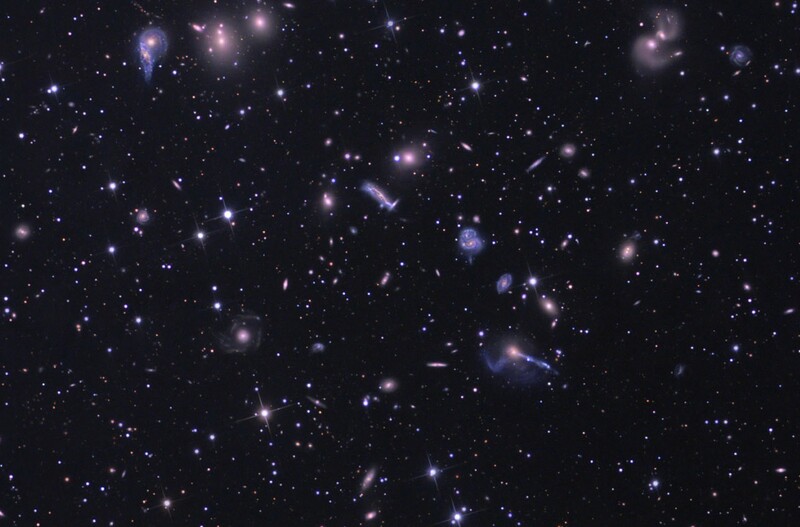 Image credit: Michael J. Longo, 2011, via http://arxiv.org/abs/1104.2815. Moreover, we wouldn’t expect any region of sky to contain a statistically significant preponderance of one “handedness” of galaxy over the other. Yet a few years ago, Michael Longo went to look for exactly that effect in a sample of galaxies from the Sloan Digital Sky Survey, and found that there was a greater abundance of left-handed galaxies in one direction… and a greater abundance of right-handed galaxies in the other. This, by the way, is exactly what you’d expect to see if there were an excess of one type of intrinsically “handed” galaxies over the other in the Universe. Even thought the difference is only around 7%, that’s a very significant figure, and the odds that this would be a random occurrence at our location in the Universe is something like 0.00002%, or very unlikely! Yet, almost no one believes that this is a real bias to the Universe, and instead it’s thought to be a bias in ourselves. How’s that? As it turns out, it’s very easy to identify the “handedness” of a few large, bright, nearby galaxies like the ones above. But most of the ones identified, even ones that were identified to have the same direction by a large number of people, may be identified that way because of a systematic bias in how the human eye processes handedness. Even a bias that only affects 3% of galaxies, for example, would be enough to account for the entirety of this effect. this is generally not thought to be robust. Image credit: NASA, ESA, F. Summers and Z. Levay (STScI), via http://www.spacetelescope.org/images/opo0416b/. Which is still interesting, because it means that there’s a lot more to learn about what we’re seeing and why! 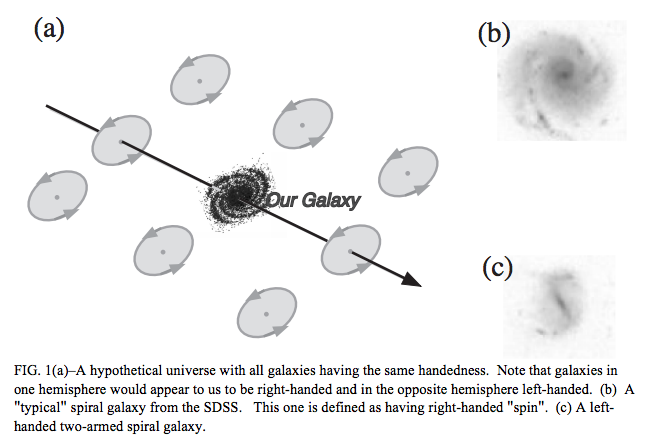 The Universe could still have a handedness to it, and if we see this “handedness” preference everywhere that would actually mean the Universe was born with a large overall rotation. But it’s going to take a lot more (and a lot better) evidence to be convincing. Still, we look, because the possibility that there is new physics out there that accounts for this is too tantalizing to ignore! Enjoyed this? Comment at the Starts With A Bang forum on Scienceblogs!